Victor Strand (Coleman Domingo) does some light housecleaning as John (Garret Dillahunt) looks on. Photo Courtesy: Ryan Green/AMC. The mid season premiere, “People Like Us,” deals with the after effects of the previous eight episodes’ time jumps. Nick is gone. Madison is dead. A new threat is on the horizon for our survivors. There’s reunion and refreshment, but all’s not well. The time jumps have finally ended (at least for now). Victor Strand’s been day (and night) drinking and his aim is slightly off. Luciana is still mourning the loss of Nick, feeling hopeless. Alicia doesn’t need anybody else’s help, but she thinks someone else just might need some. For an unknown reason, Charlie is sticking around (remember, she shot and killed Nick earlier this season) and she’s gone mute. John’s got everything he needs, being with June (although she’s afraid John won’t love her when he learns her true identity). At least for now, Morgan is headed back home to Virginia and he wants Althea to drive him there. He admits he never should’ve left Alexandria and that he actually belongs there. Morgan keeps talking about Rick Grimes (although never mentioning him by name) and wanting to return “home” to tell him he was right. Little does he know Rick will soon be dead. Post it notes tagged onto the infected, Madison is briefly mentioned and a mysterious loot box is found by the side of the road. These characters are finally coming to terms with who they are. Whether it took four years or only a couple of episodes, each character is finally coming to terms by bringing themselves back to the real world. Morgan and Alicia have a lot to make up for, so what’s next for this ragtag crew? The winds of change are blowing for this spin-off series. With no longer a family dynamic in place, each character is finally getting a chance to have real story arcs. 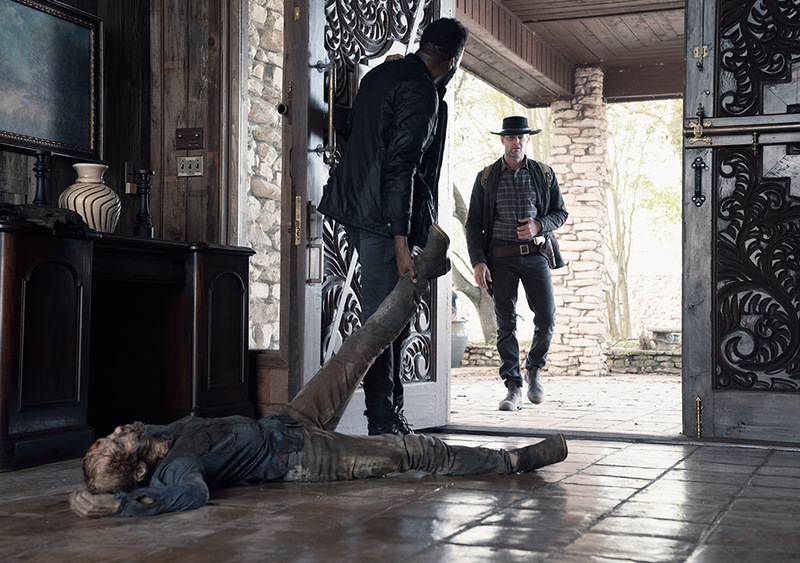 If Morgan’s return road trip remains a constant focus for the character, I predict he (along with possibly one or two current Fear characters) will wind up back with Rick’s Gang (sans the leader, himself) by Fear‘s season finale. The 100 mile-per-hour winds featured in this episode seem to have taken a cue from the Sharknado franchise (The Last Sharknado airs tonight, BTW!). Walkers are getting blown around like rag dolls. Killer rag dolls getting sucked up into the air and tossed onto Al’s battle wagon. But those are not the only winds of change. Characters are finally dealing with major weather elements during the Zombie Apocalypse for the first time on either Walking Dead series, so that’s a good thing, but there may be another storm soon arriving. Fans of Fear‘s first three seasons are up in arms with Season 4 (This loyal viewer disagrees). They’re not too happy with the new form of storytelling, the loss of the OG characters and the overall direction. Despite the extreme drop in ratings from the season premiere, Fear has basically held onto its summer audience this year, but they’re nothing spectacular. Will the show be renewed for next season? That seems to be still up in the air (pun intended). So far, the season has averaged a 0.91 rating in the 18-49 demographic and 2.59 million viewers and remains the channel’s second highest-rated series, but there are rumors looming on the horizon that a second TWD spin-off might not just be fan fiction, but reality. Our prediction? Fear, as a series, gets folded into TWD by season’s end and a few of the characters crossover to bring new life to a fading TWD. The following year, another spin-off shall debut and TWD will retire as a series. But if there’s any end in sight to this undead TV franchise, that would truly be a surprise, as it still brings in the big bucks for AMC.